Between Buenos Aires (705 km) and Mendoza (627 km), the region has a pleasant climate and the mountains are recognized by the good quality of their air. An asthmatic, who will later become a well-known character, went there for his treatment: Che Guevara. 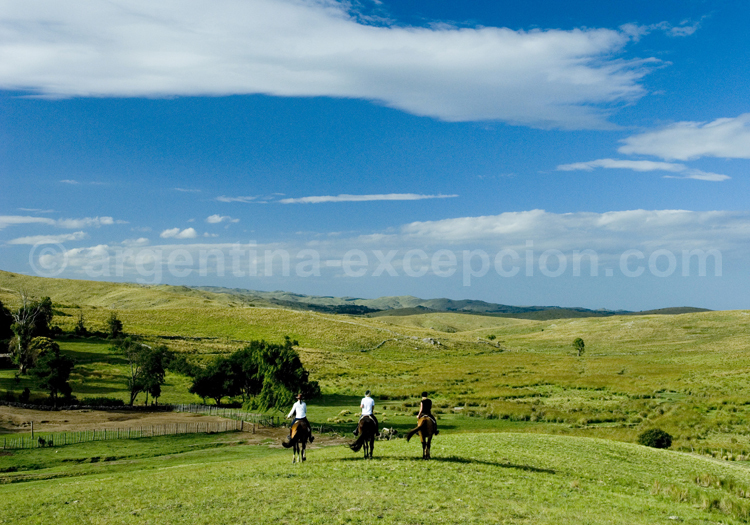 The province is a destination chosen by Argentine tourists, mainly the region of the mountains. See our page : When to go to Argentina. Before the arrival of the conquistadores, the region of Córdoba had been inhabited by Comechingones. They lived on hunting, harvesting and agriculture. Peculiarly, they lived in houses that were partly underground: the base was hollowed, as a well. The Spaniards discovered the region in 1556. In search of a stop between Alto Perú and the Atlantic, they chose this site to found, in 1573, the city of Córdoba de la Nueva Andalucía before Buenos Aires. On those times, the King allocated lands to the religious orders that wanted to participate in the foundation of the new cities. 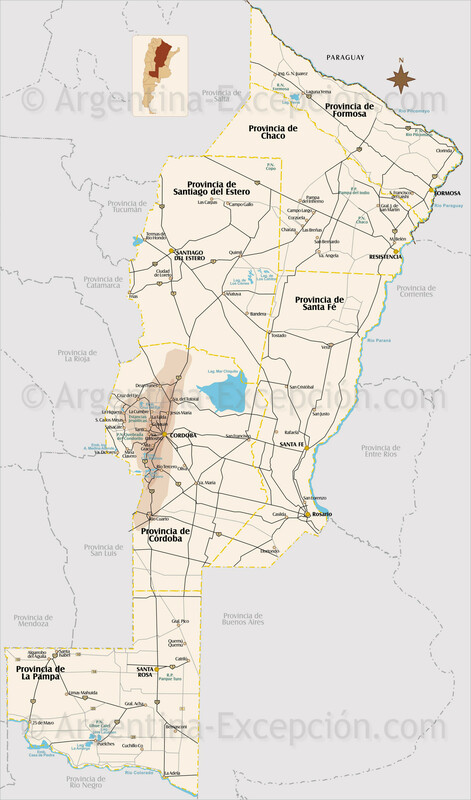 The Jesuits accepted to settle down in Córdoba and make it the capital city of the future Jesuit province of Paraguay, where the Missions would later be established. In 1613, Colegio Máximo de Córdoba was created. 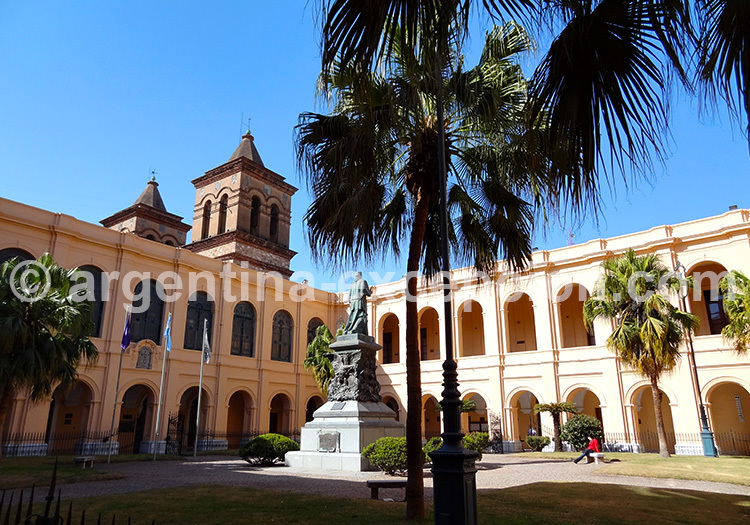 In 1621, the Pope authorized it to become the first university in Argentina, the second one in Latin America and the fourth one in America. The Jesuits that wanted to work in the Missions studied at this University, which accepted missioner applicants from all over America and Europe as well. The order soon created a novitiate to receive them and separate them from the other students: the hidalgos (“sons of something” , that is, those that did not have Jewish, Moron, indigenous, or black blood). The university, the novitiate, the church, a crypt a little farther away… To finance them all and feed the students, the order had to manage to get the funds. Thus, they decided to build the estancias and farms, some kilometers away from Córdoba. There were six and, nowadays, you may visit only five of them as San Ignacio no longer exists. When Jesuits were thrown out in 1767, their estate was seized and was either sent back to the King’s hands or given to other orders. In the second half of the 19th century, the Córdoba school and university were nationalized. Córdoba played an important part in the battles between Federals and Unitarians in the guerras de la independencia. In the 20th century, it became an industrial city with factories for the construction of planes, of aerospace material and of transportation. It was a pioneer in the activity of astral observation. “May 1968” had repercussions in the city with a great social movement in May 1969 called “Cordobazo”. With 1.5 million inhabitants, Córdoba is today the second city in Argentina and one of the first university polygons. Cosquín Folklore Festival: this small city in the Punilla Valley gets overcrowded in January for the nine-day Folklore National Festival. The 48th edition took place in 2008 with Argentine folklore guest celebrities: Mercedes Sosa, the Chaqueño Palavecino, Los Nocheros, etc. They paid a tribute to Atahualpa Yupanqui to celebrate his one hundredth birthday. The cuarteto: Córdoba gave birth to a new musical style: the quartet music. At the beginning in the 1940s, it was so-called because four musical instruments were played: piano, violin, accordion and double bass. It was a very rhythmical popular style of music despised by high society. As from 1980s, the quartet music conquered the country: at first, thanks to Mona Jiménez (a quartet singer), who refurbished his genre adding percussion instruments, and then, thanks to Rodrigo, who died in a car accident in 2000. In Córdoba, this tropical music attracts thousands of fans who go to listen to and dance this rhythm to places such as: Sargento Cabral, Complejo Forja or Vieja Usina. Traditions of the gauchos: Córdoba is one of the most important cattle-rearing and agricultural (corn, soya) provinces. In this country full of gauchos, both patron saint and folklore festivals are held with juegos tradicionales and acrobatics riding a caballo. 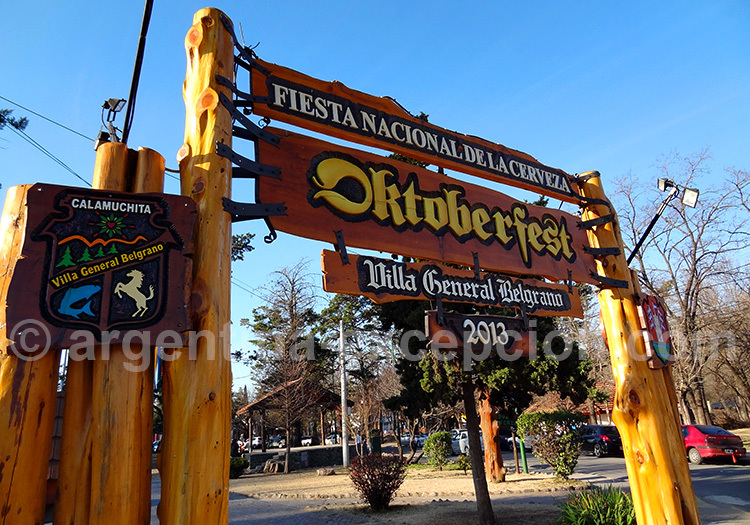 Oktoberfest in Villa General Belgrano: the city was founded by immigrants from Central Europe, and then it was developed by the survivors of the Graf Spee, a German battleship that ended up near Montevideo at the beginning of the Second World War; Villa General Belgrano has maintained the culture of their ancestors. In October, they celebrate the Beer Festival with the same Munich tradition, the Alpine Chocolate Festival, and the Viennese Pastry Festival! Museums and monuments: What to visit in Córdoba? Manzana Jesuítica is a colonial piece of jewelry declared World Heritage by Unesco in 2000. 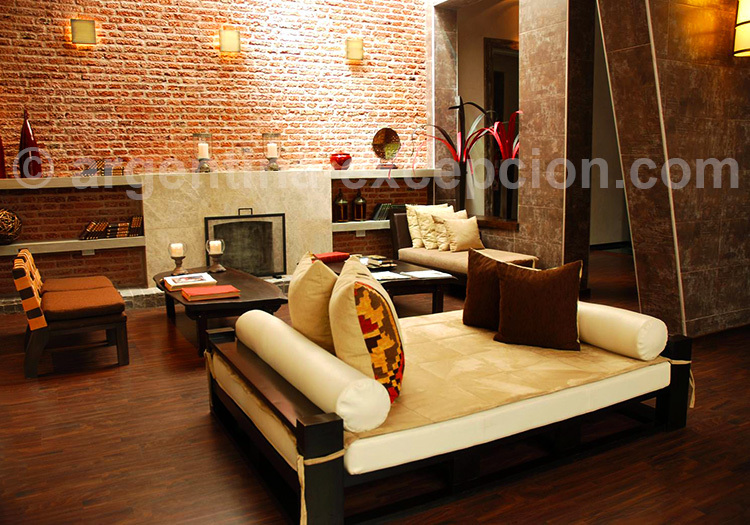 It is the historical center of Córdoba, in the heart of a charming neighborhood. Firstly, Jesuits decided to build Colegio Máximo, which, today, is the National University of Córdoba and has kept all its magnificence: the cloisters, the stunning libraries, the Salón de Grados (graduate room), an antique chapel with delicate baroque decoration… The church was built later on, as from 1640. The façade, amazingly simple, is still unfinished. Historians think that the holes around the doors were planned to hold a baroque sculpture. The architect: the Belgium priest Philippe Lemaire, an old ship builder, had the roof made in wood with the shape of an inverted ship hull. Both the roof and the altar were built with cedar wood from the missions. The door and some altarpieces are not original: when Jesuits were thrown out, their buildings were plundered to decorate other buildings. The City’s History Museum explains all this story and offers access to this legacy. It also shelters a stunning library, as Jesuits had books brought from Europe, you can find books about history, botany, medicine and, of course, theology. After Jesuits were thrown out, this legacy with approximately 12,000 documents was peculiarly given to the National Library of Buenos Aires that restored them in 2000. Among the strange pieces, you can find a ten-volume bible dating from 1645 written in seven languages such as Chaldean, Syrian… Another attraction is the old refurbished Jesuit crypt located a little farther over Rivera Indarte. Place San Martín: the most important square of Córdoba was built in 1577 and it is particularly popular. 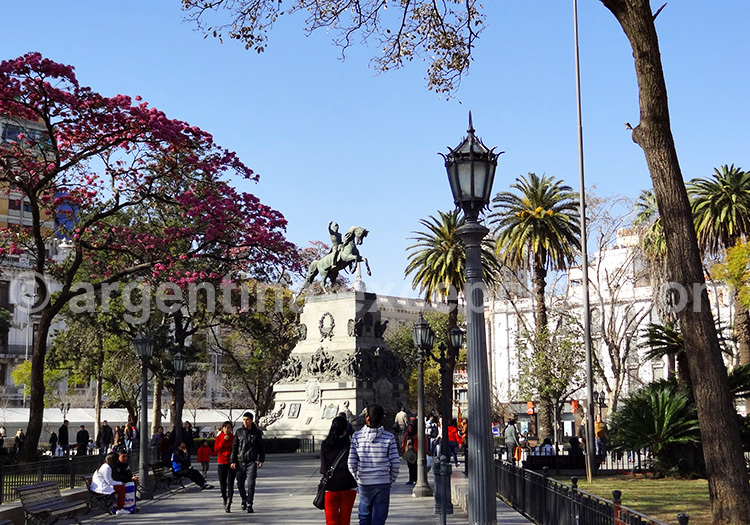 Under the shade of one-hundred-year-old trees, it is a meeting point for local people and a starting point for beautiful strolls along the pedestrian streets. The colonial cabildo with its white arches is located on one side of the square. There, you can find the tourist office and exhibitions are held. The cathedral had to be built twice and they eventually finished it in the 18th century with baroque and neoclassic style. 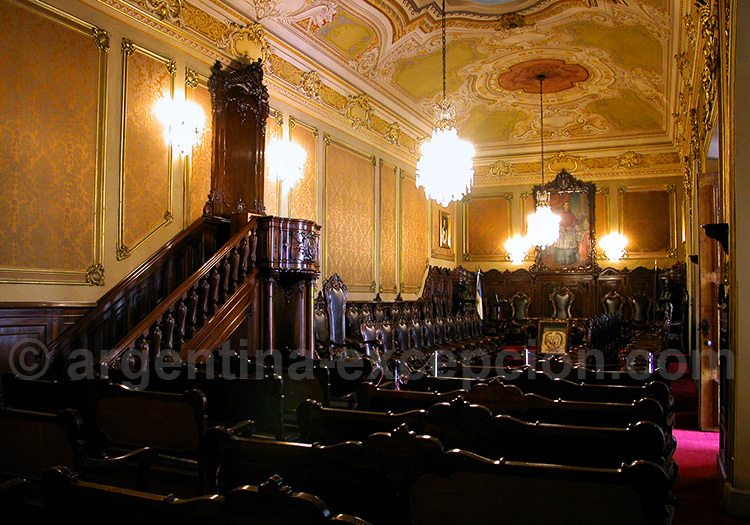 Marquis of Sobremonte History Museum: a beautiful collection exhibited in a well-preserved colonial residence. The house dates back from the 18th century and belonged to Marquis of Sobremonte, one of the last viceroys of the Río de la Plata. It has seven courtyards and a magnificently forged iron balcony. Juan de Tejeda Museum of Religious Art: one of the most beautiful of its kind. It is located in the Carmelite convent. New Córdoba: it is the old elegant neighborhood that then became a student neighborhood and, nowadays it is the epicenter of night life. This area is limited by Irigoyen Avenue, San Juan Boulevard and Sarmiento Park, a great park with zoo. Also, lovers of contemporary art may visit Emilio Caraffa Museum in this neighborhood. Hotels: Where to stay in the region of Córdoba? Estancia El Colibri, Santa Catalina: “Relais & Châteaux” estancia on the Jesuit road, about sixty km from Córdoba. It is extraordinarily charming. 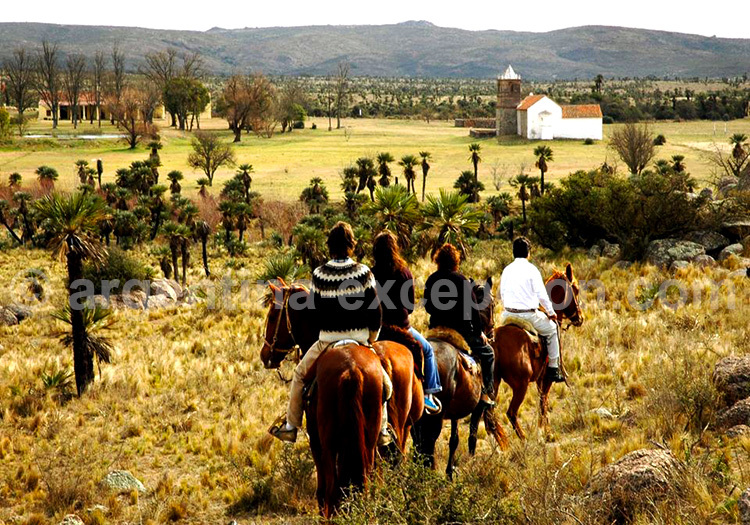 Estancia La Paz, Ascochinga: a historical residence with Italian Renaissance style about fifty km from Córdoba. You can do different outdoor activities. San Pedro Viejo Hotel, San Pedro Norte: an old guard lodge from the 18th century that was built on the Alto Perú road. Haras. Transportation: How to get to Córdoba? Avión: Taravella international airport receives daily flights Buenos Aires- Córdoba from different airlines. 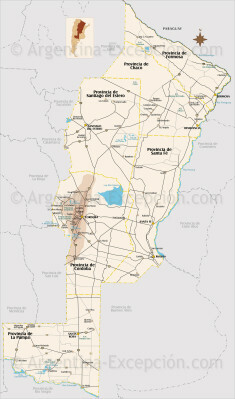 The city also has connections with the main regional capital cities (Mendoza, Santa Fé, etc.) and neighbor countries. Bus: several buses to all destinations. The trip to Buenos Aires takes approximately 10 hours. Jesuit Estancias: They were declared World Heritage together with Manzana jesuítica of Córdoba; these estancias are only some kilometers away from Córdoba and were built by the Jesuits to finance and feed their many boarding university students. There were six estancias and, nowadays, you may visit only five of them as San Ignacio no longer exists. Fruits, vegetables, cereals, wine, meat… everything was produced locally then. Mules were raised as well; they were the means of transportation necessary for the interchanges of the viceroyalty. 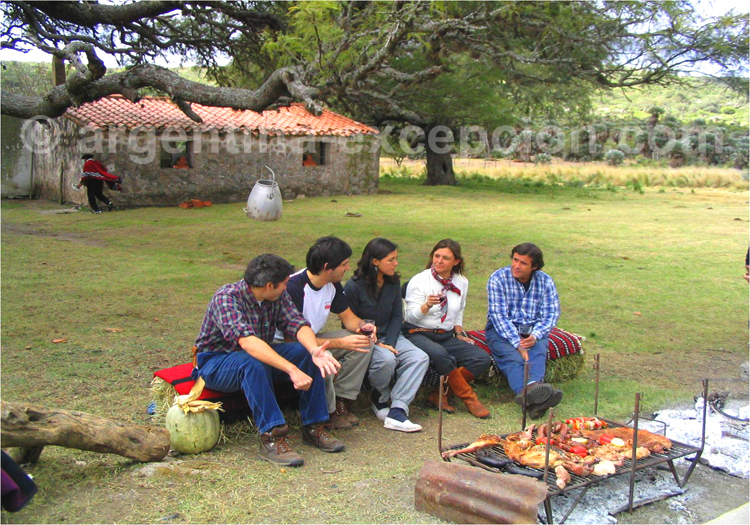 The first estancia was built in 1616 in Caroya, the last one in 1687 in La Candelaria, in the middle of the mountains. They were vast lands. Indians collected the harvests and stayed in settlements, now gone. 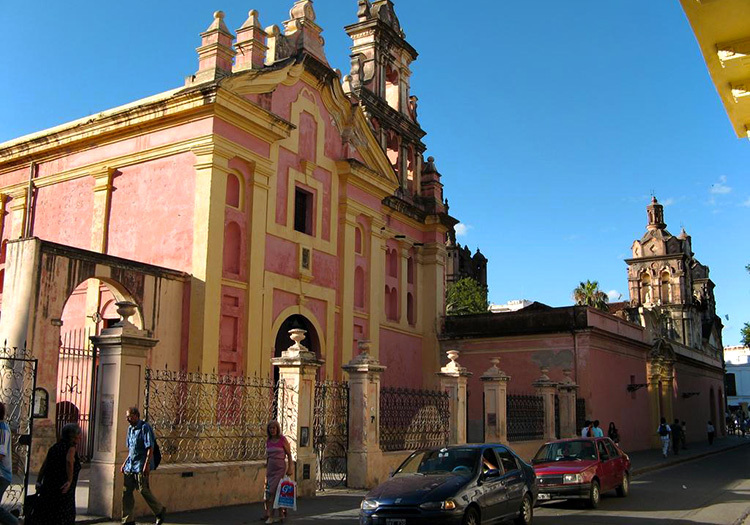 The estancias in Jesús Maria and Alta Gracia have organized exhibitions over the colonial history. In these production facilities, the priests did not disregard their evangelizing mission. They used very realist religious sculptures. Another attraction: the amenities. These toilets ultra-modern for the time were typical of the Jesuit houses, and used tap water and an evacuation pit between two walls. Santa Catalina is the biggest estancia that may be visited nowadays, and it is also the only one that is privately owned. 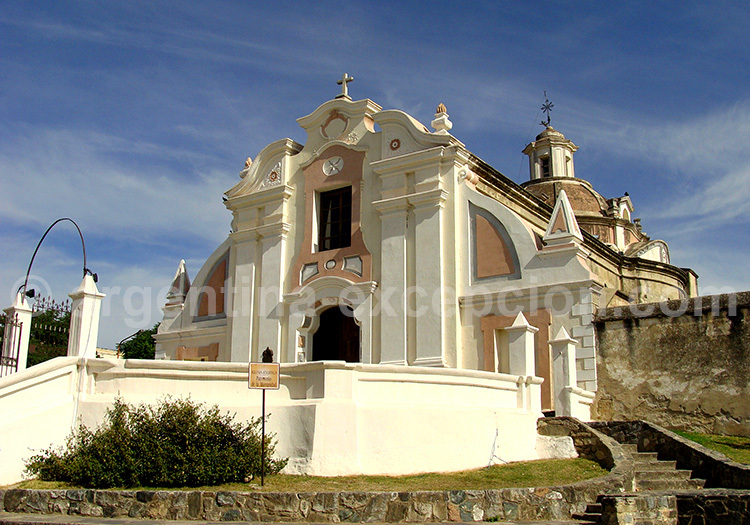 The estancia is not always open to the public but you can always visit the beautiful baroque church painted in white. Do not forget to visit the estancia in Alta Gracia: located in the town called Alta Gracia; the museum is specially interesting and you may also visit the museum dedicated to Che Guevara who spent some time in this town to treat his asthma. Córdoba Mountains: Prior to the Andes mountain range and located to the West of the City of Córdoba, these old mountains are subdivided in four regions. On the North, the green Punilla Valley offers different activities outdoors. La Cumbre attracts paragliding lovers. Los Terrones and Ongamira: landscapes with strange shapes that catch the attention of UFO students. On the Southeast, towards Sierras Grandes, you go through El Condorito national park, which was created to protect the cóndor de los Andes that comes to this narrow pass to make his nest and breed. Going along to the South, you find Calamuchita Valley: at the bottom of Cerro Champaqui, it is a place chosen by hikers and a culminating point of the Mountains. In the summer, some beach stations come up in the Mountains along the shore of the clean rivers or the quiet lakes: Villa Carlos Paz, Mina Clavero in Traslasierra Valley, etc. Mar Chiquita: this enormous salt lake on the Northeast area of Córdoba was declared a Provincial Reserve. It is a truly ornithological Paradise with 350 species of birds, among which you may find: pink flamingos, parrots and pilgrim falcons. Circuit in the Córdoba estancias: a 12-day encounter with nature and Córdoba traditions in three estancias of the region. The program includes: learning about the work at the big farms devoted to cattle-rearing and agriculture, meeting the gauchos, strolls and horse rides, visits to Jesuit estancias, etc. Polo in Buenos Aires and Córdoba: 9 days to take up or improve the sport at two great estancias.